Most of us carry at least a single device that has a built-in capability to play back audio files, which is why those of us who tend to commute a whole lot to and from work daily tend to tune in to our favorite songs, being oblivious to whatever’s going on around the world, at least, until we see where the train has stopped in order to get off. Well, that is just fine and dandy, but some of us do hope that we are able to share the next best musical act (in our books, at least) with the rest of the crowd, and one of the ways to do so is to have a decent portable speaker – preferably wireless. This is where the Switch wireless portable speaker designed by the folks over at Native Union would come into play. Basically, Switch allows you to enjoy your music, movies and games with powerful sound and active bass. Apart from keeping folks entertained, it also doubles up as a professional conference call solution that will play nice with the rest of all Bluetooth enabled devices. Oh, the pros of the Switch do not just end there, as it can also function as a power bank and juice up whatever tired USB mobile devices that are in your possession on the go. 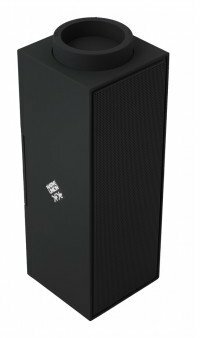 Just like the Sony PS2, it does not matter if you want to place the Switch wireless portable speaker in a vertical or horizontal manner, the decision ultimately lies with you without causing any degradation in sound quality. The Native Union Switch wireless portable speaker was launched at CES earlier this year, and it will retail for $149.99 a pop. Your ears will definitely be able to appreciate all the technology parked underneath the hood, as it is powered by a trio of high performance drivers, aided by an active sub-woofer which ensures your tunes will sound amazing regardless of the musical genres of your choice.